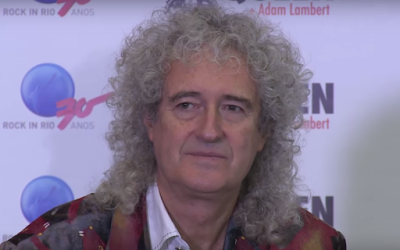 MetalRockNews: Queen's Brian May: "Adam Lambert shares Freddie Mercury's connection with people"
Queen's Brian May: "Adam Lambert shares Freddie Mercury's connection with people"
Queen were recently interviewed at Rock In Rio in Rio De Janeiro, Brazil, you can read some excerpts below. About the similarities and differences between Mercury and Lambert, Brian May said: "Well, there are differences, you know, but I think perhaps the greatest thing about Freddie is his connection with people, with an audience, and Adam has that. And I don't think that's something you can learn; I think it's something which you either perhaps have in you or not. You have to dedicate yourself, and Adam, like Freddie, is dedicated to his art. But without that, whatever that wonderful talent is, I don't think it would happen. When Adam walks onto a stage, it's not Freddie, and it's not him trying to be Freddie, but when Adam walks on and when Freddie walks on, something happens; there's some kind of catalytic action that happens between people, and it's a very rare and special thing. So I would say that's something that Adam and Freddie share, and I know that Freddie would agree with that. I mean, without even speaking about the voice. I mean, the voice… they both had, and have, incredible voices, the kind of voice that you don't find in a billion people. And, of course, the voice is very special, but it's not enough. You have to have the will and the spirit to use that wonderful instrument that you've been given to make that connection."